Making Peace with Your Thighs: Get off the Scales and Get on with Your Life is an easy-to-read book about battling negative self-perceptions. The author does a great job of exploring the many factors in the American environment that contribute to negative self-esteem, then demonstrating how this negative self-image relates to everything we do. The information would be very useful for individuals battling with eating disorders, anyone on an eating disorder treatment team, and even family members or friends of those with eating disorders. I have already recommended the book to a few people that I know would benefit from learning how to spin a negative self-image into a positive one. The author, Dr. Linda Mintle, PhD, is a licensed marriage and family therapist with experience as a social worker and as a national speaker. She has experience working with psychiatric disorders, focusing on eating disorders, and with her background as a therapist, she is able to provide accurate information on patients and their views from her experience. Dr. Mintle connects to the reader by using anecdotes from her life, both serious and entertaining, while interjecting humor into otherwise bleak situations. She comes across, through her writing, as an empathic individual who is easily approachable with her laid-back attitude and the experiences she has gone through that she highlights in the book. She is very rooted in her religious belief which permeates not only the book but every other aspect of her career. I have a very different religious background but nevertheless was able to relate to a lot of her belief system and approach. Over all, the book was well organized. The chapter titles were clever – for example, “Thighs and Sighs of the Times,” “You and Me and Body Make Three” and “Dates and Mates” – and the material in each section is explained thoroughly. I had an easy time relating to the material and understood the references. The drawbacks, though few, are understandable given Dr. Mintle’s perspective as a counselor. For example, she included a lot of information about eating disorders but only mentioned dietitians by name in one small area as a passing thought for meal planning. This was disappointing as there were many instances that dietitians could have been highlighted, especially given the case studies she used. There was one part that did not sit well with me, which was the section on weight loss towards the last quarter of the book. Dr. Mintle suggests that the key to weight loss is “simply” to eat less and exercise more, which of course could be very triggering to the very individuals who would benefit from other areas of the book. Even with these drawbacks, Making Peace with Your Thighs: Get off the Scales and Get on with Your Life is a gem thatprovides valuable assistance for anyone on the journey to self-acceptance, whether they are a patient or a professional. Analyzing the effects of media, family, friends and the dreaded mirror in our lives can help readers see ourselves in a new light. 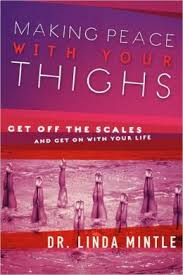 Making Peace with Your Thighs: Get off the Scales and Get on with Your Life is available in paperback through Amazon at http://amzn.to/1800Hf2.